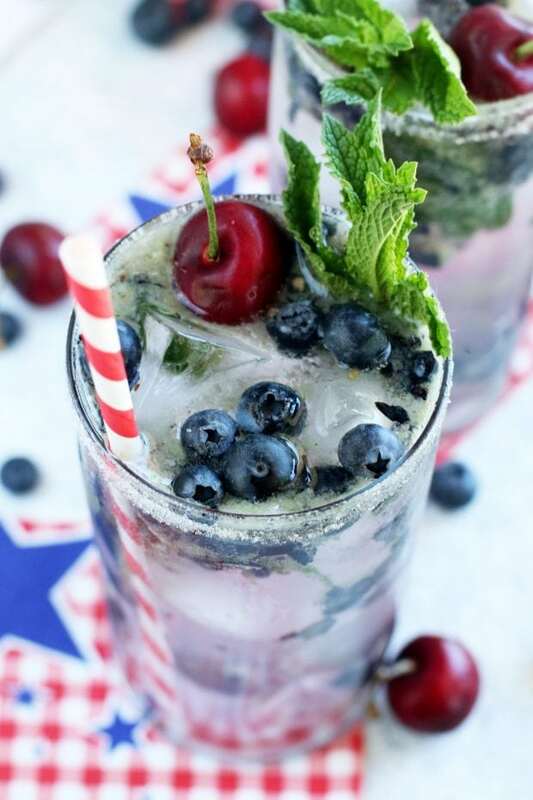 A Cherry Blueberry Mojito is just the red, white, and blue cocktail you need to bust out to celebrate July 4th this year! 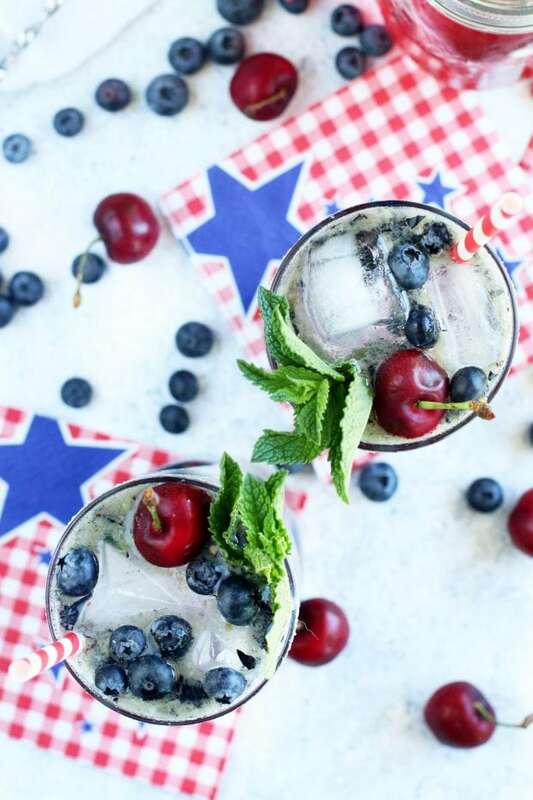 Featuring an easy homemade cherry simple syrup and fresh blueberries, this minty fresh drink will quench your thirst and get everyone into the mood to celebrate. It’s a fantastic drink to take advantage of those ripe cherries and blueberries! 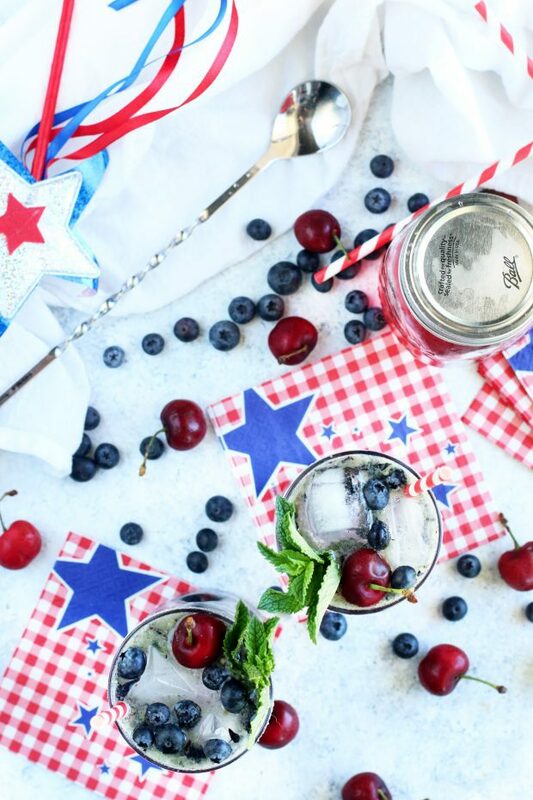 The sun is out in full force, the grills are firing up, and the red, white and blue recipes are about to pour all. over. us. 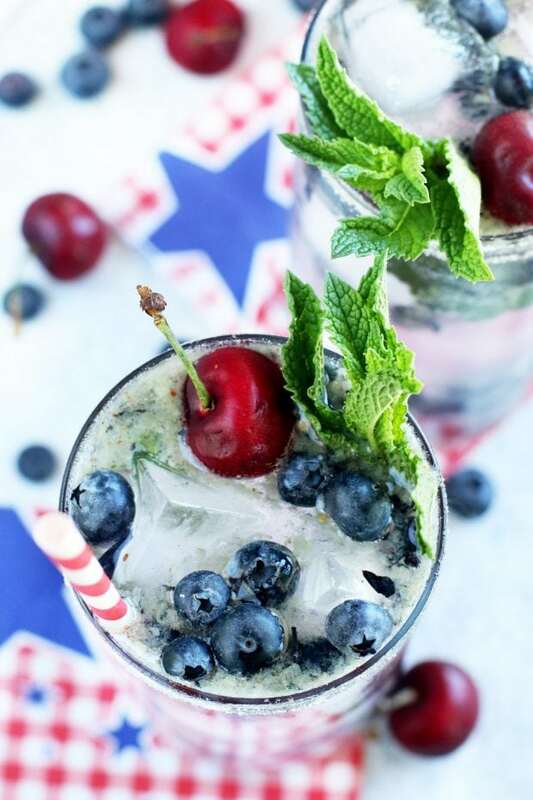 Now I am normally not one to go to the red, white, and blue themed recipes, but this year, I got inspired when I tried this cherry blueberry cocktail while I was out and about in Denver. I’d never tried to combine cherries and blueberries, but once this combo hit my lips, I was sold. I am addicted to fresh berries normally, but cherries are a serious weakness when summer rolls around. Surprisingly cherries and blueberries are a match made in heaven. 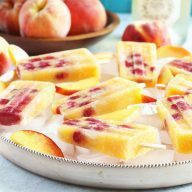 The fruity flavors, the tartness, and so much more make the flavor combo incredible. So there’s the red and the blue… Now it’s about the white. And for me, that’s a mojito. Of all the clear drinks that I imbibe in, a refreshing mojito is totally it. The mint, the light rum and the bubbly soda water is just the combination that gives the ultimate refreshment to beat the heat. 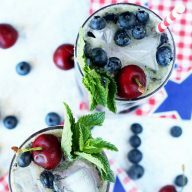 Both cherries and blueberries are a perfectly accompaniment to the minty freshness of this cocktail! I made an easy peasy homemade cherry simple syrup to go into the mojito in lieu of traditional sugar. Then you simply muddle the blueberries with the mint and make the mojito the traditional way! It’s a simple, fresh drink that everyone will flip out over and constantly ask for second helpings of! Time to get in the spirit of the red, white, and blue my friends!! 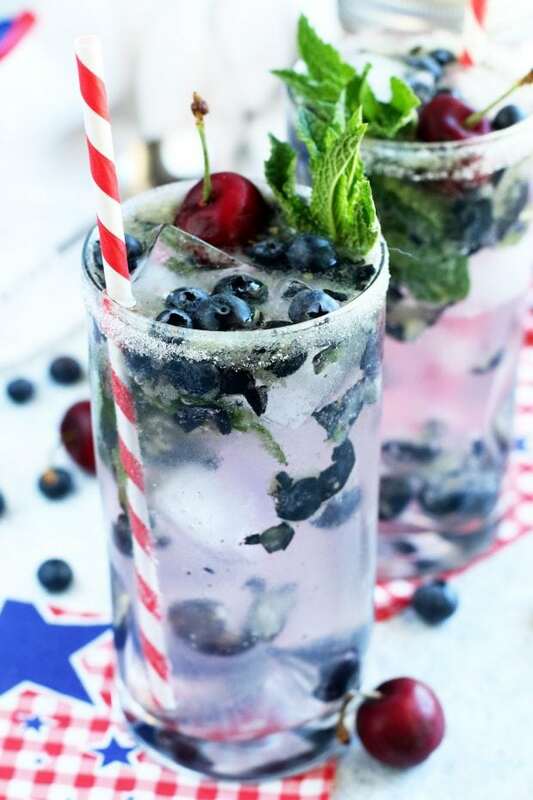 Pin this Cherry Blueberry Mojito recipe for later! 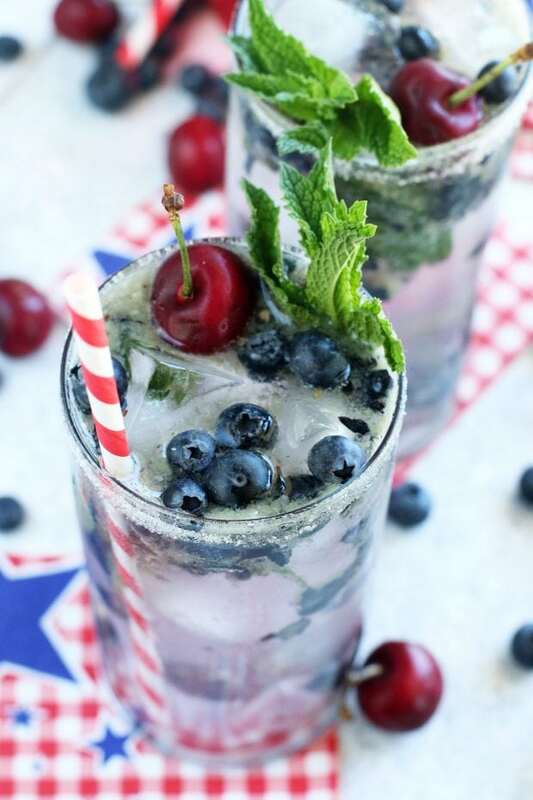 A Cherry Blueberry Mojito is just the red, white, and blue cocktail you need to bust out to celebrate July 4th this year! In a small saucepan, bring ingredients for the homemade cherry simple syrup to a boil over high heat. Stir to dissolve sugar and remove from heat. Cover and let steep 30 minutes. Drain out cherries and save simple syrup. Chill simple syrup completely before assembling cocktails. Divide blueberries and mint leaves between two cocktail glasses. Use the muddler to gently crush the mint leaves. Stir in 2 ounces of rum into each glass, as well as half the lime juice. Top with club soda and garnish as desired with fresh blueberries, fresh cherries and mint leaves. Nothing makes me think PARTY quite like a themed drink. This is a winner! Refreshing and delicious! 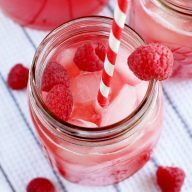 This is such a fun, festive drink for the holiday! Love it! 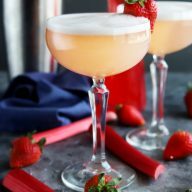 I see this cocktail in my near future. I think these will be pouring on the fourth. It looks really festive! Would love to try this! What an amazing drink! Adding this to my ,ust-make list! This looks perfect for summer! Definitely must try this drink! So festive! They looks ridiculously refreshing!